My baby arrived on 27th of December, 2011 and put an end to a long wait. Everyone was waiting with eagerness for the baby to arrive. The day was special for sure. A rose had blossomed that morning as if indicating the arrival of our baby later in the day. My wife says that it is a rose indicator. 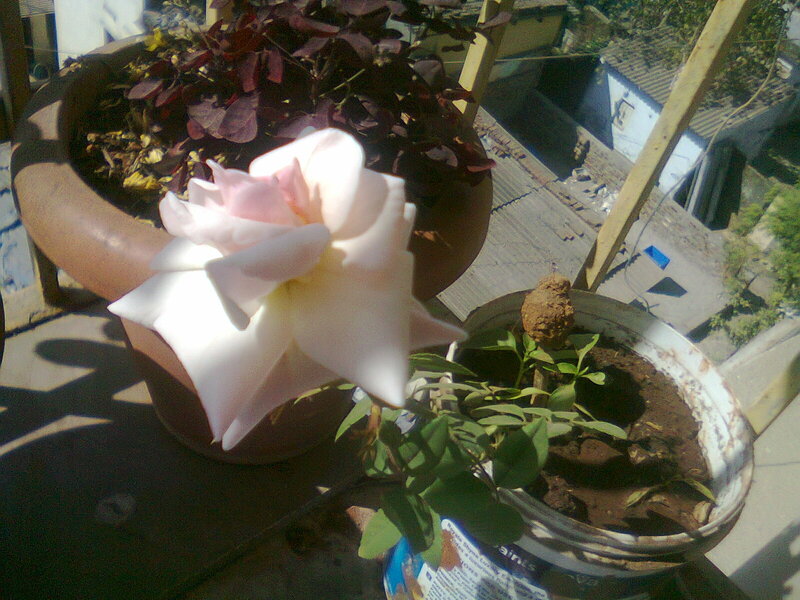 The rose plant itself was special. 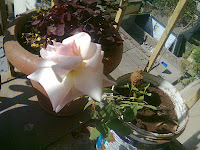 This rose plant was almost dead. Considering it dead we had initially tried to uproot it. However, the strong roots it had developed made us to think otherwise. That decision did not go in vain as the first flower it borne happened to be an indication of a very special day for me and everyone in my family. That night the moon too had a special smiling face and there was a star shining brightly near the moon. She truly is an angel. On 27th December (Tuesday) the day started as usual for me. I reached office around 3 pm. I had just settled down and started to do some work when my sister-in-law called in to inform that my wife has been hospitalized. With a mixed feeling I left for home. I said mixed feeling because my wife had to undergo lot of hardships during 3rd month of pregnancy. She was even hospitalized. So, I was hoping that everything turns out well. Along with my mom I headed for the hospital. My wife was taken to the labor room at around 8:30 pm. By 8:55 pm we heard our baby’s voice crying out loudly as if announcing her arrival. We were all so elated but at the same time worried as we were not provided any formal update on the status of my wife. Something was wrong. An hour or two later the doctor informed me that my wife is having excessive bleeding post delivery of the baby and to arrest the bleeding he suggested that she be put on general anesthesia so that he could do the needful to stop the bleeding. I gave my approval for the same. The doctor also asked us to get 2 pouches of blood as lot of blood has been lost and the blood pressure was also dropping. Late in the night we reached the blood bank and got the blood which was administered to my wife. Her blood pressure was being monitored continuously and it was slowly and surely getting to normal. The baby was handed over to us much before my wife was moved to the room. However, the tension had kind of suppressed our joy for a while. Once we realized that my wife is out of danger, everyone breathed a sigh of relief. The baby weighing 2.75 kg was healthy and in good shape. With lot of hair on her head right from day one, my mom made reference to my birth. She said that I was also having lot of hair right from day one. Then everyone who visited was trying to figure out as to who the baby resembles with. Some would say that she looks like my wife. While few others would say that she looks like me. It was amusing. On the very first day, I was a bit nervous to hold her. She seemed so delicate and I felt I might hurt her. However, on second day, my nervousness gave way to my inner desire to hold her in my hands. It was a special feeling. Being instrumental in bringing someone to life is the closest I think one can get to Godliness. We have found a name for our bundle of joy. However, I will be announcing it only after the naming ceremony. You guys must be wondering why it took so long to write this blog. Being a first time dad does take focus away from other priorities of your life, isn't it?